Any show on the US TV network Fox has to realise that its days could be numbered. Fox have the reputation of axing cult shows before their time from Arrested Development to Family Guy. Despite their cancelation these shows are still being made. Firefly was not so lucky. This was a science fiction/western mash up that just cost a little too much for Fox to fund for more than a dozen episodes or so. But like a typical Joss Whedon character, the show would not stay dead. With the great film Serenity under their belt the show continues in written form, but is The Magnificent Nine by James Lovegrove mere fan service or something worth reading in its own right? The crew of The Serenity are bobbing around quite happily in space avoiding trouble, but like most days, trouble comes looking for them. In this case it is from an unusual source as it appears that grumpy sociopath Jayne may actually have a friend. An acquaintance from the past needs Jayne to raise an army to protect her town from bandits. With no army to call on, Jayne takes the next best things; the crew of The Serenity. The basic story of Nine is signposted quite nicely from the title alone. This is a play on the classic The Magnificent Seven, but instead of Yul Brynner you get the quick guns and quips of Captain Mal Reynolds. The town of Coogan’s Bluff is surrounded by bandits and their leader is as mean as he is ugly. Thankfully, Mal et al are not averse to getting down and dirty themselves having fought through more than a few scrapes in their time. Nine is a very enjoyable book to read, despite the violence. The secret is that Lovegrove is able to perfectly capture the chemistry that made the show so much fun. The crew of The Serenity are a ragtag bunch and when you think about it, a bit rubbish. However, they have heart and each other’s backs. Lovegrove reflects this perfectly from the way the characters act to the way they speak. You can hear the voices of each character in your head and you are able to visualise the dusty town in the middle of nowhere. The show is captured best in the actions of our protagonists. They may be heroes, but not in the White Knight mould. On more than one occasion Mal or Jayne shoots before asking questions. It is perfect Whedon like writing; why would you wait for a psychopath bad guy to finish his sentence when you can shoot them dead? The action set piece that concludes the book is very satisfactory taking a Firefly tilt on the Magnificent Seven ending. Elsewhere in the book there is some character development, mostly surrounding Jayne meeting an old flame and her daughter Jane. I felt this element of the story was a little too signposted and I was able to figure out what was going on before the characters on several occasions. As the book is set between the series and the film it would be extremely hard to actually make a major impact on the crew without effecting how the film would have come out, so I can understand Lovegrove’s resistance. 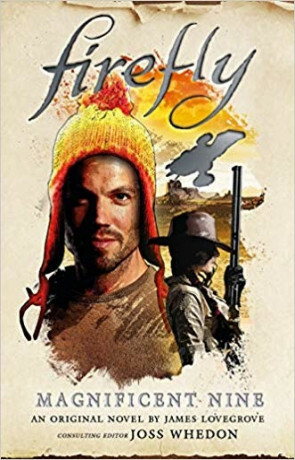 I am not convinced that a non-Firefly fan would gain as much from this book as a fan will. There is a great joy to be had revisiting old friends who have been captured so brilliantly. To a layman the book will be an odd twist on an old movie, but to fans you get so much more. The banter is back, the fun is back. It makes you wish that the series would return, but if the books remain as entertaining as this I will still be content enough just to read more of them. Written on 9th April 2019 by Sam Tyler.